Punctuation lends clarity and precision to communication, and as a consequence is a powerful toolset. Here’s an illustrative video that drives the point home. 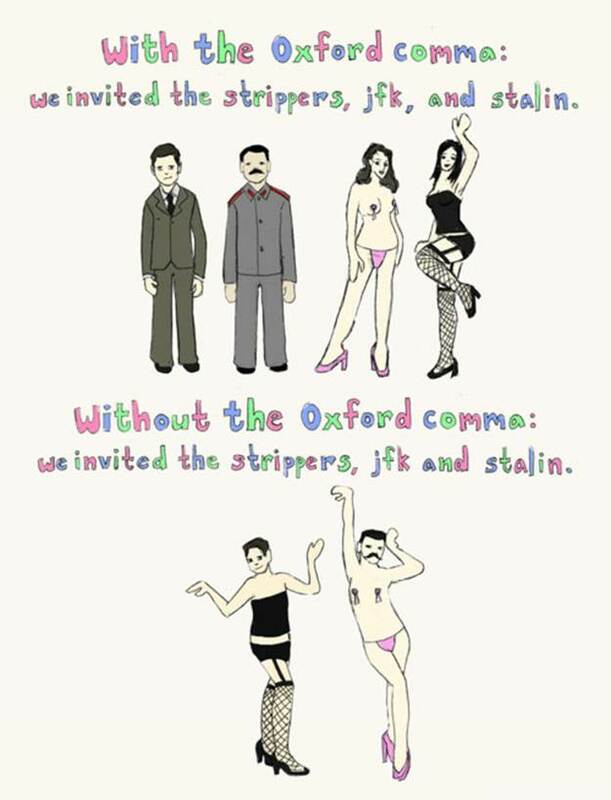 I prefer “Oxford comma”, first because that’s the name I originally heard, and second because it seems likely that it was used at Oxford considerably before being used at Harvard. When I write, I consciously try to influence the inner monologue or speech pattern of the reader, so as to most effectively make my points. The Oxford comma lets me do this. The alternative, which is to link the final two things in a list simply with an “and” is, to me, simultaneously abhorrent, unclear, and not a good representation of how we actually speak. You can find other fun images here. This all just leads me to conclude that while the Oxford comma is imperfect, it remains better than the alternatives…and also that people have lots of misplaced passion.